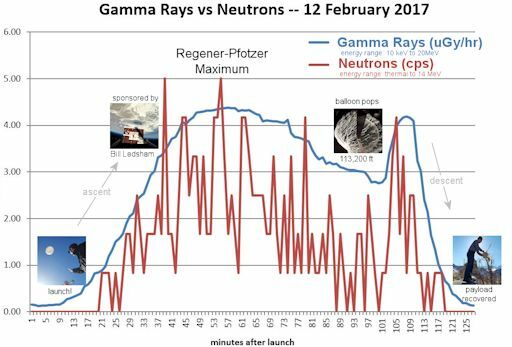 Feb. 15, 2017: On Feb. 13th, something amazing happened in the stratosphere over the Arctic Circle. Normally, the air 60,000+ feet above Earth’s surface is dry and utterly transparent. 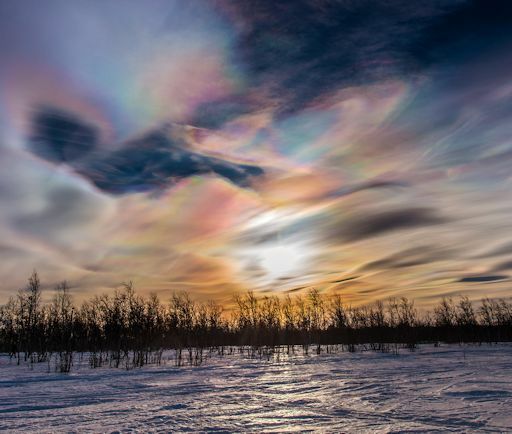 On the eve of Valentine’s Day, however, the Arctic stratosphere filled with a gossamer haze of crystalline ice, and when sunlight hit the freezing crystals, the sky filled with clouds of intense iridescent color. Good thing. 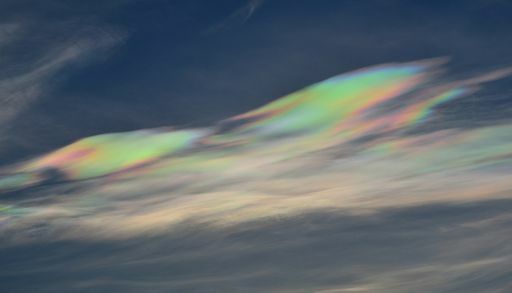 They witnessed an exceptional display of polar stratospheric clouds (PSCs). PSCs are a sign of very cold temperatures in the stratosphere. 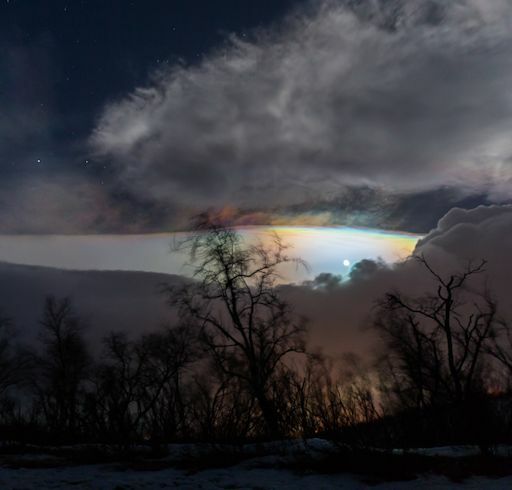 For ice crystals to form in the normally arid stratosphere, temperatures must drop to around -85º C. So while it was strangely warm on the ground below, it was incredibly cold up above. Once thought to be mere curiosities, some PSCs are now known to be associated with the destruction of ozone. Indeed, an ozone hole formed over the UK in Feb. 2016 following an outbreak of ozone-destroying Type 1 PSCs. To investigate these clouds further, Spaceweather.com and the students of Earth to Sky Calculus will travel to Abisko Sweden for a week in March 2017. We plan to launch a series of space weather balloons into the Arctic stratosphere, measuring temperature, air pressure, and ambient radiation. If PSCs are present, our sensors will pass directly through them, and our cameras can photograph the colorful clouds at point blank range. Stay tuned! This is a remarkable episode of PSCs–the best in many years according to some longtime residents of northern Sweden. Arctic sky watchers should remain alert for more, both day and night, as this unusual winter continues. According to multiple longtime residents of the area, the Feb 13th display was exceptional. 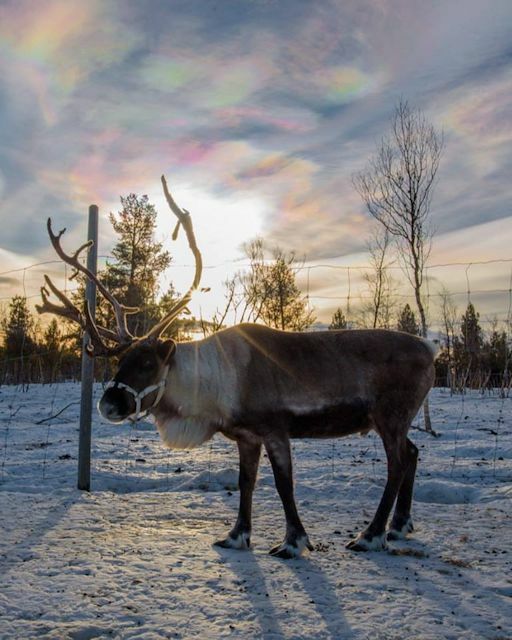 “Everyone I spoke to agrees it was the best they had ever seen,” says Chad Blakley, who operates the Lights over Lapland tour guide service in Abisko, Sweden. PSCs are a sign of very cold temperatures in the stratosphere. The clouds are made of ice. Indeed, that is the source of their remarkable color: High-altitude sunlight shining through tiny ice particles ~10µm across produce a bright iridescent glow. For ice crystals to form in the very dry stratosphere, temperatures must drop to around -85º C.
Michael Jäger of Stixendorf, Austria, took the picture on Dec. 31, 2016, just as the comet was swinging around the sun en route to Earth. Since then 45P’s icy nucleus has been heated by solar radiation, causing it to spew brightening jets of gas into the comet’s green atmosphere. Why green? Because the comet’s vaporizing nucleus emits diatomic carbon, C2, a gas which glows green in the near-vacuum of space. According to the Minor Planet Center, this is the 8th closest pass of any comet in the modern era (since ~1950, when modern technology started being used to study comets). It will only be 31 times farther from Earth than the Moon. Interestingly, 45P made an even closer approach on its previous orbit (23 lunar distances), so it is also on the list as the 5th closest. Proximity makes the comet bright despite its small size. Forecasters say 45P could be on the verge of naked eye visibility (6th magnitude) when it emerges into the pre-dawn sky later this week. The best time to look is during the dark hours before sunrise between Feb 9th and 12th. 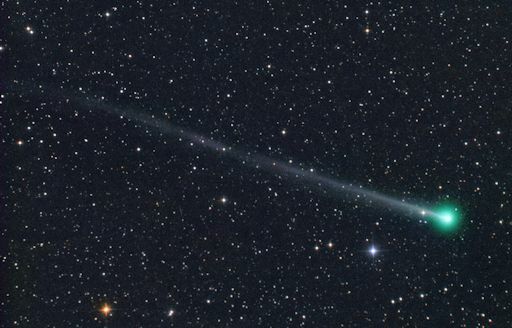 The comet will be racing through the constellation Hercules high in the eastern sky. Sky maps: Feb. 9, 10, 11, 12. Got a great picture? First, submit it to Spaceweather.com. Next, send it to the Planetary Science Institute, which is collecting amateur images to help professional researchers study Comet 45P. More resources: 3D Orbit, Ephemeris.